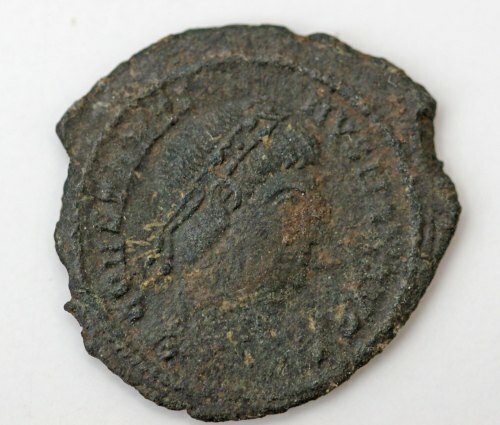 A complete copper alloy Roman nummus (AE2) of Constantine I (AD 306-337) dating to the period AD 330-335. Reece Period 17. GLORIA EXERCITVS (two standards) reverse type, mint of Lyon. Submitted via email, object not seen by recording FLO. Copper alloy nummus of Constantine I (AD 306-337), dating to AD 330-335 (Reece Period 17). Reverse: GLORIA EXERCITVS, 2 standards. Mint of Lyon. 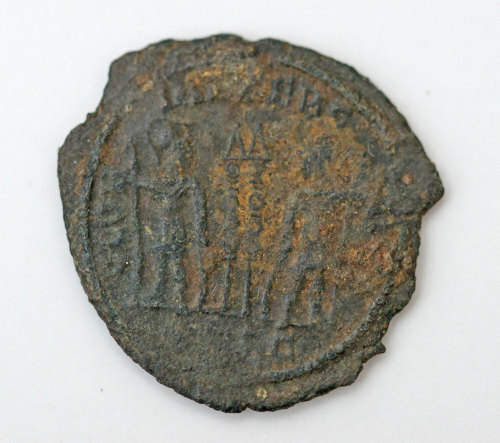 Copper alloy nummus of Constantine I (AD 306-337), dating to AD 330-335 (Reece Period 17). Reverse: GLORIA EXERCITVS, 2 standards. Mint of Arles.